Physical backup is a copy of an application’s binary files that is performed on hard drive level using common file system queries, rather than using the application’s interfaces designed to export its data. For example, Windows registry can be exported in two ways: using regedit, which is a built-in client designed for administering system registry, or by direct copying of the respective files from the Windows folder. The first case is logical backup, because the data is retrieved via API provided by Microsoft, and the latter is physical backup. The main advantage of physical backup is its speed: it doesn’t interact with internal design of the application and therefore needs to make fewer operations. In most cases, physical backup can’t be used for granular backup, i.e. it doesn’t provide a way to back up objects smaller than entire data files. For example, the Outlook Backup plug-in in Handy Backup copies files used by Microsoft Outlook, but can’t back up individual e-mail messages. Running applications, such as database management software, keep a lot of data in memory cache and save it to the disk only when stopped. Copying files of such applications doesn’t provide backup consistency. Read more about application backup software for PC. 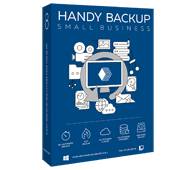 With Handy Backup, you can perform both physical and logical backups. Physical backups can be performed with any HDD files on the disk, which is achieved with the help of Volume Shadow Copy Service Backups. Logical backups can be made available for several database management systems, through the use of MySQL Backup and other plug-ins. Try the Small Server edition of our software - full featured backup solution for workstations and servers. Free 30 day trial!